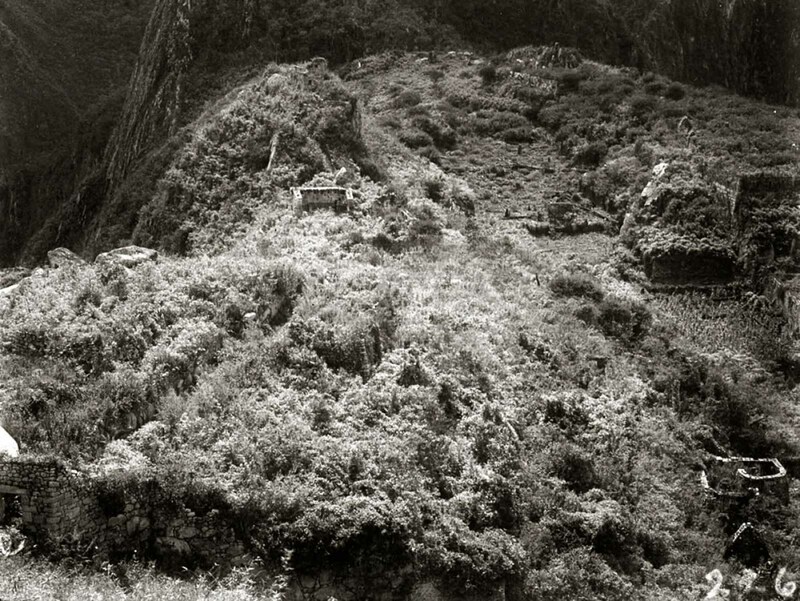 The ruins of Machu Picchu covered in jungle growth in this 1911 photograph taken when Yale archaeologist Hiram Bingham first came to the site. In the summer of 1911 the American archaeologist Hiram Bingham arrived in Peru with a small team of explorers hoping to find Vilcabamba, the last Inca stronghold to fall to the Spanish. Traveling on foot and by mule, Bingham and his team made their way from Cuzco into the Urubamba Valley, where a local farmer told them of some ruins located at the top of a nearby mountain. The farmer called the mountain Machu Picchu, which translates to “old peak” in the native Quechua language. Bingham and his team hiked six days with excavation and camera equipment from the city of Cusco to the town of Aguas Calientes, where he inquired at an inn about local ruins sites. The innkeeper told Bingham about an overgrown complex at the top of the hill that towers over the town. Bingham paid the innkeeper to guide him. Midway up the precipitous, jungle-choked hill, Bingham’s guide stopped and instructed a boy to take the American the rest of the way up. When they reached the ruins site, Bingham found himself on a ridge between two jagged peaks, surrounded by distant snowcapped mountains, 2,000 feet (610 meters) above the raging Urubamba River. The jungle had all but consumed the site, but Bingham could make out multiple stone-covered terraces and walls made of carved granite boulders that proved a city had once stood on this rugged, remote precipice. Bingham later wrote that “Machu Picchu might prove to be the largest and most important ruin discovered in South America since the days of the Spanish conquest”. Bingham set up his tripod and camera that day and spent the afternoon photographing. Over the next several months, he and his team cleared jungle from the ruins, uncovering exquisitely built houses, temples, steps, and terraces. 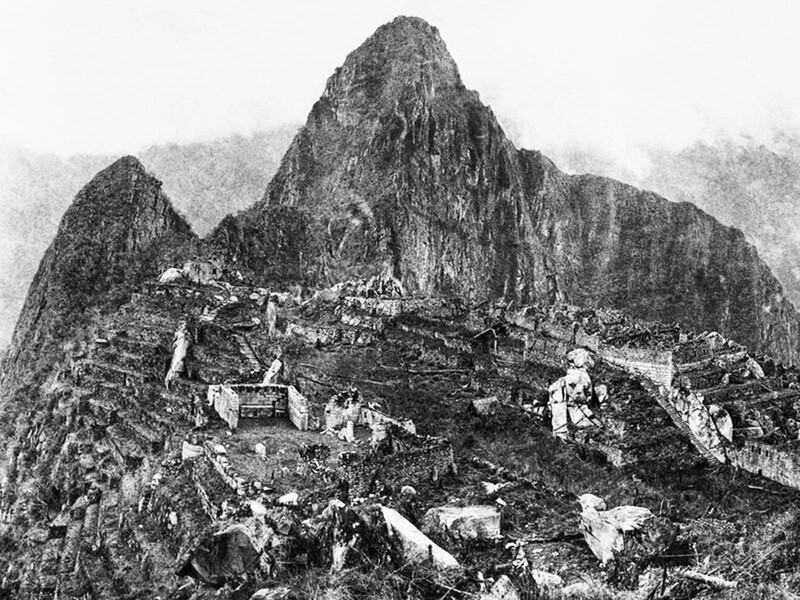 Bingham returned to Machu Picchu in 1912 with a team to begin excavation of the site, and then briefly visited again in 1915 (pictured). Archaeological evidence shows that people practiced agriculture in the Urubamba and adjacent valleys since 760 B.C. Between 1300 and 1500 AD, the Cusco kingdom developed as a city-state, beginning with the government of Manco Capac. The Vilcabamba region can under Inca control in 1440 during a campaign conducted by Pachucutec, the 9th inca king. This was one of the first phases of territorial expansion for what would become the Tahuantinsuyo Empire. According to scholars, Machu Picchu was a royal estate built for the Inca king Pachacutec around 1450. Others speculate the Inca city was a sacred center where the great political, religious and economic minds of the Inca Empire gathered. The population of Machu Picchu ranged between 300-1000 inhabitants and consisted mostly of members of Pachacutec’s lineage, religious elite, and highly specialized artisans recruited from across the empire, called yanaconas. When Bingham found the ruins of Machu Picchu he uncovered a treasure trove of artifacts that he took with him to Yale University, including mummies, bones, ceramics and precious metals. The Peruvian government has long requested the university to return these items, which are estimated to number over 40,000. The most important structures at Machu Picchu are the Temple of the Sun (also called the Torreon), the Temple of Three Windows, the Temple of the Condor, and the Intihuatana Stone. The Intihuatana Stone (meaning ‘Hitching Post of the Sun’) was an astronomical observation device used to determine the precise periods for different festivals and celebrations of importance in the Inca religion. The site covers 80,000 acres (32,500 hectares) and is divided in an urban area and an agricultural area. It is estimated that 60% of the construction was underground, including deep building foundations and crushed rock for drainage. The urban area comprised an upper part where the royalty lived and temples were built, and a lower part for workers quarters and warehouses.